The students at Clear Spring School grades 1 through 6 are making things to see at their own market. Some have been working on things in wood shop. Many have been working on products at home so their parents are involved. It's a learning process. They visited the local farmer's market this week to help them plan the event. They'll be mostly selling to family and friends and to each other. Yesterday some of my students began work on the lathe, not to sell but to practice and learn. 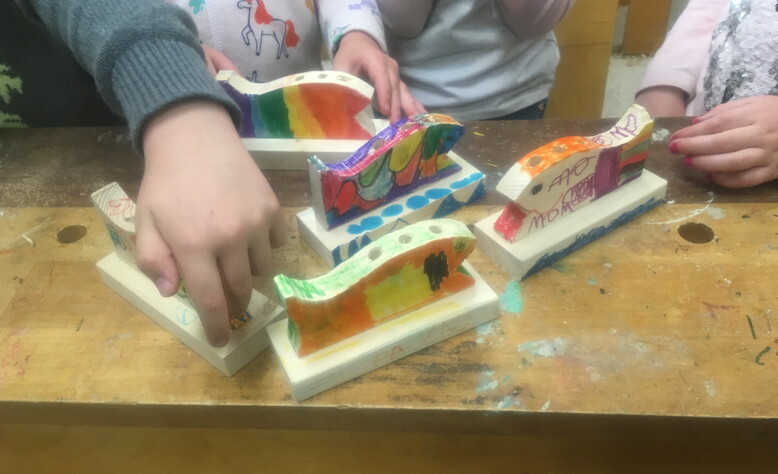 Yesterday my Kindergarten students made pencil holders. One said, "I plan to keep this on my shelf with my collection." That describes how the things my students have made are welcomed into their homes. The editing of my woodworking with kids book was delayed by a staffing change at Spring House Press, but is about to resume. Today I will review files and make certain they are properly placed in relation to the table of contents. I will also oil boxes and resume sanding on the large maple plank. 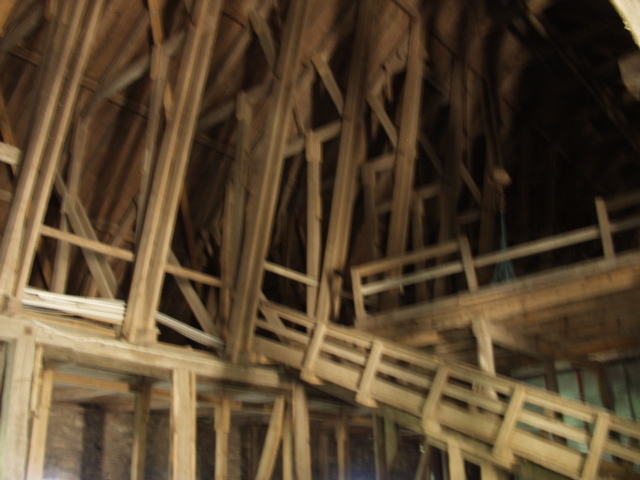 The photo shows the inside of the loft of the large stone barn at Nääs, Sweden where I visited a few years back. The photo is fuzzy due to being taken in near darkness, but it shows the kinds of framing that one might find hidden in the remaining roof of the Cathedral of Notre Dame. For a craftsman to visit such places is a gift. This barn, all stone on the outside, was built in the 1700's. The dairy barn that once served the castle at Nääs and then Otto Salomon's school for Sloyd is now a stable for horses, and very few would know of the wonders above. You would have to be a laborer or a sneak to find it. John Ruskin bridged the terrain that lay between the designer and user, the economics of supply and demand by pointing out the effects of building on the builder... the common man at the heart of all things. The following is by English professor and legal scholar John Matteson in a 2002 essay, "Constructing Ethics and the Ethics of Construction." ...we tend to think principally in terms of the relationship between producer and consumer, and we assume this to be the most significant relationship in any activity related to commerce. Our ethics unconsciously orient themselves around the relationship between supply and demand. Ruskin is valuable to us because he did not share these assumptions. He rejected the idea that buying and selling lay at the heart of the ethics of architecture. He focused not on production for the purpose of consumption, but on the moral effect of the production upon the producer. He required above all that the process of building should, in all ways possible, enlist the emotion, the imagination, and the intellect of the laborer. As they begin the process of saving the Notre Dame Cathedral, perhaps they should think less about what it will cost or what it will look like when fixed and more about how the process of restoration can transform and restore individuals and society. All the great monuments of architectural genius were built by common folk whose contributions should be held in the very highest regard. Plans should be cast to have the maximum developmental impact on the workmen and women, knowing that craftsmanship (not religion) is the foundation of ethical culture. I have always found stones that interest me, and to have a use for them makes them of even greater value. These are embedded in clear epoxy resin in a recess in the top surface of a table top. The recess was formed then a limb was lost and decay was introduced in the living tree. Bark and new wood grew over. I carried these common stones home from Maine after teaching at the Center for Furniture Craftsmanship. There are billions more like them on beaches throughout the northeast and along lakes and rivers around the world. The clear resin is intended to make them look as though they are under water, with the exception of one that barely breaks the surface. The duct tape forms a dam to keep the epoxy from leaking out low spots on the side. 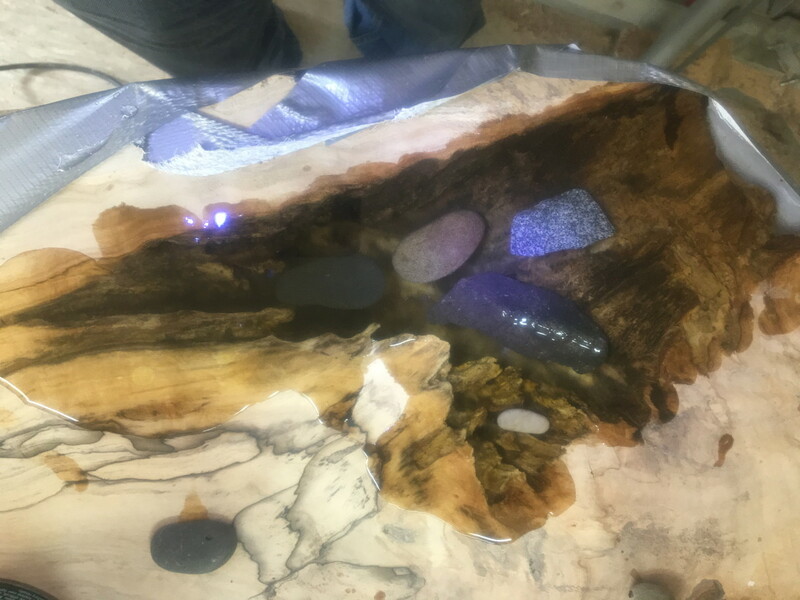 The epoxy will be planed flush with the surrounding wood, and the areas of wood that have been stained with overflow will be sanded. As suggested by Bob Rokeby and by reading online, I found my heat gun to be useful in making bubbles rise to the surface of the layers of epoxy. I applied the epoxy in 5 layers, mixing only 4 ounces at a time and allowing each layer to set before the next was applied. The stones were put in place resting on layer three and then covered in the next two. Wood and stone are the materials of civilization. Man shapes them. They, in turn, shape man. Make. fix, grow and create. 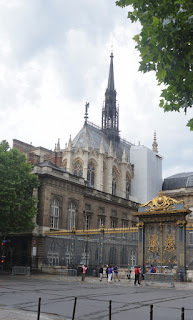 The photo shows Notre Dame Cathedral in 2014 with roof and spire. It will take years for it to be restored. I am thankful that enough of it remains that it can be rebuilt. The hands shape human culture. The hands have the capacity to reshape civilization. I hope visitors to Paris will find an army of young men and women of all racial and ethnic backgrounds with saws and planes launched into the process of restoration. You cannot make old wood, but you can make new craftsmen and is that not the point of a cathedral? Who will worship there if you've not first shaped the spirit? The hands do that through our quest for useful beauty. 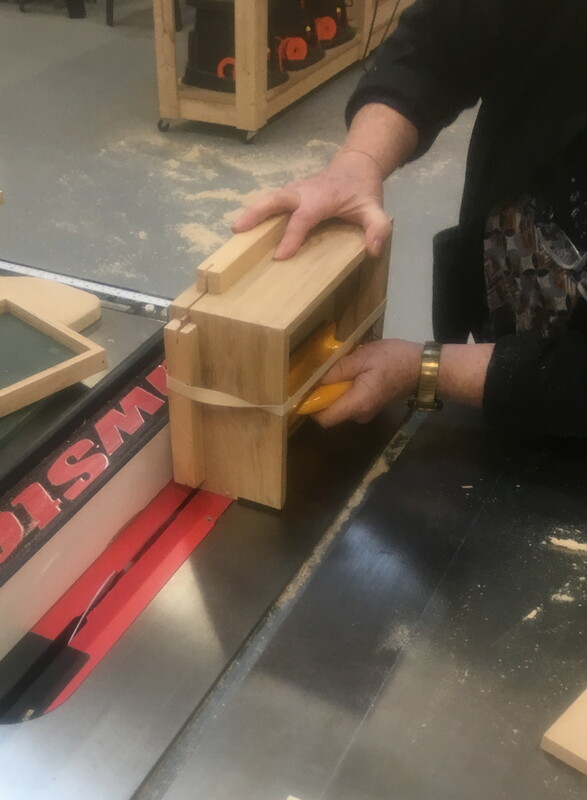 My sixth, 7th, and 8th grade students have been hand planing white oak, so they should be aware of the difficulty of building a cathedral in the 11th century with hand tools alone. 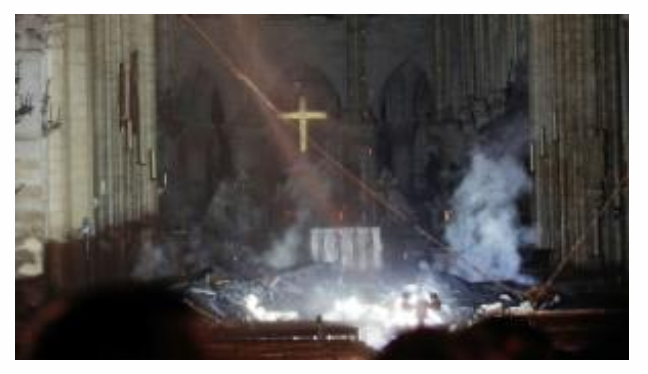 This is not the first cathedral damaged by fire, so there are folks around from the last time that can help. According to John David, a master mason from the UK who had been involved in a cathedral renovation there, "What I've heard a number of times today is people saying 'we can't do this anymore, we haven't got the craftspeople to do it.' We have. We have plenty, and we have plenty of people who can train others." Make, fix, grow and create. Provide for others to learn likewise. Yesterday was a sad day. We watched as Notre Dame Cathedral burned. I think of the hands that worked on the place through generations. It was said that the roof alone required 14,000 trees, a whole forest of wood, and then we remind ourselves that each piece was planed and shaped and fitted by hand, and that with that shaping by hand and mind, folks wrestled with wondering. Who am I, why am I here, how do I make the best of my life, and how do I assure the best for my loved ones and my community. The use of the hands in crafting useful beauty brought answers to many questions. Just as it does today. In the coming restoration of Notre Dame, there will be the promise of work, and growth and development of new generations. That is my own reassurance in the aftermath of a tragic day. Make, fix, grow and create. 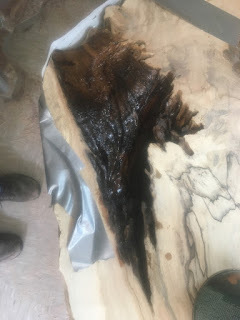 I am preparing to fill a void in wood using epoxy where a branch had died and surrounding wood had grown over. Researching on the web I learned that air trapped in the wood can rise through the epoxy forming bubbles. To solve this problem I've used polyurethane to seal the inside surfaces of the void, and after the polyurethane has had a few days to dry fully, I can begin adding the epoxy 3 ounces or so at a time, gradually filling the void level to the surface of the surrounding wood. It's experimental. My fingers are crossed. I have been waking up in the middle of the night wondering how to solve this problem. My next question has to do with whether or not to add objects to the void or leave it so that you can peer clearly into the depths. No, I will not put LED lighting inside. Some craftsmen might be inclined to add colorants or powdered turquoise. I prefer a more natural look and the opportunity to look within. Tomorrow I start my Jewelry Box class at the Eureka Springs School of the Arts. Make, fix, grow and create. Our culture depend upon it.